Hair loss is a common complaint from both men and women. In fact it affects over 56 million Americans. The good news is that in many cases, the cause of the hair loss is reversible and something can be done about it. We looked at 18 of the most popular hair loss shampoos and considered them for ingredients they featured, cost, size of bottle, organic or not, customer feedback and other considerations. The three hair loss shampoos reviewed below were all at the top of the list in all of the categories we considered. Any one of these hair loss shampoos would be an excellent choice for taking care of your hair loss problem. There are many different factors to take into consideration when it comes to choosing the right hair loss shampoo. It is important that you know what you needs are when you start looking for the right hair loss shampoo for your hair. There are different things that can cause hair loss so it is important that you try to narrow down the cause of your own hair loss as much as possible before you purchase your hair loss shampoo. You also need to know what your scalp and hair type is. With so many different hair loss shampoos on the market, if you know your scalp and hair type you will be able to choose the correct shampoo not only for your hair type but for your type of hair loss as well. Ultrax was rated the top rated shampoo for hair regrowth stimulation in 2015 and there is no question as to why. The main ingredient in this fantastic anti-hair loss shampoo is caffeine which has been shown to block testosterone in the skin. Reduce hair loss and even stimulate hair growth. A lot of hair loss shampoos take a regular shampoo and add some ingredients to it but that is not what Hair Surge is about. It contains .2 % Ketoconazole and other caffeine compounds such as saw palmetto that will not only stop hair loss and shedding but stimulate growth. This shampoo is easy to use, made in the USA and offers A 100% money back guarantee that if you are not completely satisfied they will refund your money. 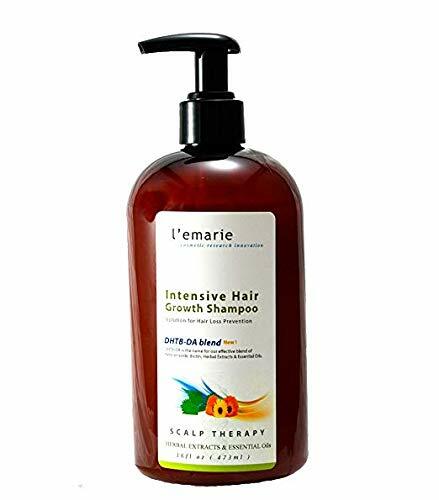 There are many benefits to using L’emarie Hair Loss Shampoo and growth product. It contains several ingredients that have been documented to show a reduction in hair loss as well as new growth of hair. Ingredients include Ketoconazole, which decreases DHT, Pyrithione Zinc, Biotin, DHAT blockers and Salicylic Acid and Tea Tree Oil. This product not only helps with hair loss but it takes care of a lot of scalp conditions like dandruff, fungal infections, and seborrhea dermatitis. It will also help the condition of your hair by repairing split ends and moisturizing the scalp. Your scalp will feel fantastic and your hair will start to look fabulous as well with the proper use. You should use this hair loss shampoo every 3 or 4 days for at least 8 weeks. Leave it on for 4-5 minutes at a time. If you’re suffering from hair breakage, itchy scalp, scalp psoriasis, hair thinning, dry scalp, alopecia, seborrheic dermatitis and other scalp and hair conditions, this fragrance and chemical free product will help you turn things around. PURA D’OR anti-hair loss Shampoo is organic and has popular Argan oil in it that comes from 100% plant based extracts. These are combined with the other ingredients that do not contain any SLS, which are sulfates, no parabens, or any other harmful chemicals that only increase hair loss. This hair loss shampoo is the best anti-hair loss treatment shampoo on the market. It contains advanced DHT blockers plus a lot more. All of the ingredients in this hair loss shampoo have been clinically shown to decrease hair fall and thinning hair. It is also good for correcting scalp problems. The PURA D’OR Anti-Hair Loss Shampoo has a formula that blocks DHT and feeds the hair follicles with all of the nutrients they need to come back to life and start regenerating. The biotin that the shampoo contains will strengthen your hair while the niacin increases the circulation. The DHT blocking blend of ingredients promotes the growth of your hair. It is safe for all of the hair types and is color safe as well. You will need to use this product for at least 3 months for results that you will notice. Hair loss can be a very distressing problem for both men and women. Fortunately there are some terrific products on the market that can help with this problem that affects millions every year. Choosing a good hair loss shampoo is one of the first steps that you will want to take to turn around your hair loss. With all of the choices of hair loss shampoo available it’s always important to know you own specific needs so you can choose the one that will work the best with your hair loss problem. The three hair loss shampoos that we have reviewed above are all excellent products in the hair loss prevention and correction industry. They include important ingredients that are responsible for eliminating hair loss and help the hair grow back in. Reading the customer comments can give you even more insight into these three valuable hair loss repair shampoos. For both men and women, there are different things that can cause the hair to start falling out or thinning. There are several different categories that these causes fall into. We’ve listed them below. Hormonal – One of the most common reasons for hair loss can be linked to hormonal conditions. Whether it is male or female pattern baldness, which is also called androgenetic alopecia, the hair loss is triggered by changing hormones. Hair thinning and loss is genetic to some extent, especially if the cause is hormonal rather than situational. Pregnancy and the beginnings of menopause can also cause hair loss. Medical – There are several medical conditions that can cause hair loss and shedding. The hair loss can be a side effect or a result of a medical condition. One such medical condition is alopecia areata. This is a disease that causes your body’s immune system to attack the body. It attacks the hair follicles and cause large, smooth patches of hair to fall out. Another medical condition that causes hair loss is called telogen effluvium which is a condition that causes large numbers of hair follicles to shut down in hibernation mode, resulting in hair loss and a lack of hair regrowth. Other medical conditions that can cause hair loss include thyroid problems, skin infections and others. In most of the medical causes, once the underlying problem is fixed, hair growth can resume. Medications – Some medications can cause hair loss as a side effect. Chemotherapy is a well known treatment that causes hair loss. In addition, the medicine used to treat high blood pressure, depression and some heart issue medications can cause hair loss too. Other potential causes – In addition to the causes we have covered above there are many other situations that can cause hair loss. Things like emotional or physical shock like sudden and extreme weight loss or severe stress or trauma can cause the hair to thin and/or fall out. Some hair styles can cause thinning or hair fall too so be careful of tight styles that put a lot of stress on the hair. More than likely you have already loss some hair and you’re looking for a way to prevent any more from coming out. Some hair shedding is normal, but the normal kind of shedding doesn’t result in thinning. Follow the steps we’ve outlined below to slow down or prevent anymore hair loss. Look for hair loss shampoos with organic ingredients. The synthetic ingredients are usually full of chemicals and can cause more hair loss. Look for ingredients that encourage circulation like cayenne and other similar products. You want to see in the ingredient list things that will get the blood flowing up to the scalp. Saw Palmetto is one of the best natural DHT blockers you can get. If you find a product that contains this valuable supplement, that will benefit you quite a bit in your battle against moiré hair loss. Ketocoanazole (called Nizoral) – This anti-fungal ingredient is most often used in treating dandruff. All Natural Ingredients – Look for hair loss shampoos that include vitamins and minerals like Green Tea, Emu Oil, Nettles, Saw Palmetto and others that help to block DHT naturally. Circulation Improvers – Bad circulation can be a culprit in hair loss and the lack of regrowth. Improve the circulation of your scalp and you will awaken the hair that has fallen into a dormant stage. Below are a couple of ingredients that are known for their circulation properties. Ginkgo biloba – This plant is used in regular medicine to improve your circulation. There have been some studies that are indicating it could be good for hair loss. Caffeine – Caffeine has another use when it comes to hair loss. Not only does it block DHT it is also used as a way to increase the blood circulation so it reaches the scalp. Argan Oil – This valuable and beneficial oil stops the hair follicle from shrinking. It also keeps the hair you have strong and resilient. Argan oil also encourages the hair to grow back. More Volume in the Hair – While your hair is growing back, there are some hair loss shampoos that have ingredients in them that will add volume to the hair. These ingredients, such as protein extracts from different sources, will help plump up the hair and make it look fuller while the hair is growing back. If the shampoos you are considering have harsh chemicals and detergents in them such as sulfate based ingredients, you want to avoid them. They can cause more hair loss. If you use products with glycerol in them can weigh hair down and make it look limp and flat. If your hair is already thin, this will make it look even thinner. Parabens are harmful ingredients that you want to avoid whenever possible. It has estrogens in it that are harmful and that cause hair loss. Parabens are used in many products as a preservative and should be avoided as often as possible. Lauryl sulfate is another ingredient that should be avoided due to the damage it causes to the hair. It is usually used in products that are designed to plump up the hair and make it look fuller, but in actuality hair loss can result from using it. Treating hair loss can be a frustrating and patience testing process. Many people want to see results right away but if a product claims to have hair growth results in a few days, you don’t even want to bother because that is not a true statement a product can make. Hair loss reversal and hair growth take time. You should plan on using a product 60-90 days before you expect to see any results that are obviously noticeable. With all of the different causes of hair loss out there, you may feel like you are just guessing as to why your hair is falling out. Many of the reasons that hair loss occurs can be treated, especially in women, so even if you are experiencing hair loss right now, take heart that it will be able to be fixed. Finding a high quality hair loss shampoo is one of the first steps that you want to take to reverse a hair loss problem. The top rated hair loss shampoos reviewed here are all excellent products to consider with high customer satisfaction rates and good results histories. The information in the buyer’s guide is designed to help you sort through all of the choices so you can make an informed decision and choose a hair loss shampoo that you will be pleased with.